After the events of the penultimate stage of Paris-Nice, earlier in the month, when the Movistar team accelerated as Omega Pharma-Quick Step’s Levi Leipheimer was picking himself up off the tarmac, it was no surprise that the Belgian team returned the compliment after Alejandro Valverde hit the deck in today’s Volta a Catalunya stage. The Murcian rider, who won the 2009 edition of the race, crashed on the way out of the feedzone with 51km to go, and was unable to rejoin the main peloton. Despite a hard chase - with the help of his teammates - Valverde was unable to rejoin the peloton, and finished the stage 2’09” down on stage winner Michael Albasini (GreenEDGE). “Just as we were heading out of the feedzone, there was a bottle on the road, the front wheel got over it and I crashed on my right side against a kerb,” he explained after the stage. “It was practically an inevitable crash. I got on my feet again but I was feeling mostly dizzy after the crash, and I took some time to get going again. Valverde now trails race leader Albasini - who has won both stages so far - by 4’01” and, more significantly, the overall contenders like Leipheimer by 2’29”. If he can recovered sufficiently from his crash injuries, he may be able to take victory in one of the five remaining stages, but overall victory is now all-but beyond him. Movistar directeur sportif José Luis Arrieta had a good view of the incident, and its consequences, from the Movistar team car. “We were stopped at the side of the road with Nairo [Quintana], who had had a flat tire,” he explained, “and at the feeding zone the route was casually narrowing to a single-way road, which made things more complicated together with the fact that the feedzones are always chaotic. The peloton was now accelerating, with Omega Pharma-Quick Step at its head, and the Movistar riders were having problems getting back to in the race. 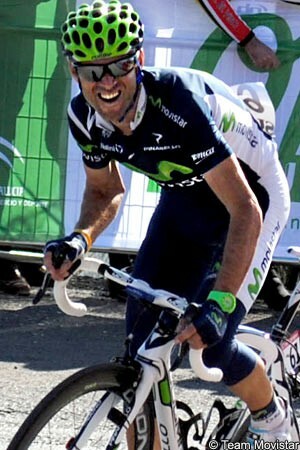 The only rider not called back to work for Valverde was Sergio Pardilla, who ended the stage in sixth place. He now sits in 13th place overall, on the same time as Leipheimer and the rest of the contenders, 1’32” behind Albasini.